Italy pulled off the biggest upset of the 2018 CGSE • Million Tinkle World Men Championships, sweeping defending champion USA, two-games-to-none, in the best-of-three games championship match to win its first-ever gold medal in the prestigious five-player team event at SCAA bowling center in Hong Kong Tuesday night. The team finals were played in Baker format where each player plays two frames per game. The lead off player bowls the first and sixth frame, the second player the second and seventh frame and so on. In the first semi-final match, six-time World Championships Team champion USA (1963, 1971, 2006, ’08, ’10 and ’17), the no. 1 seed flew past no. 4 Singapore, 238-194 and 216-189, for a 2-0 victory. 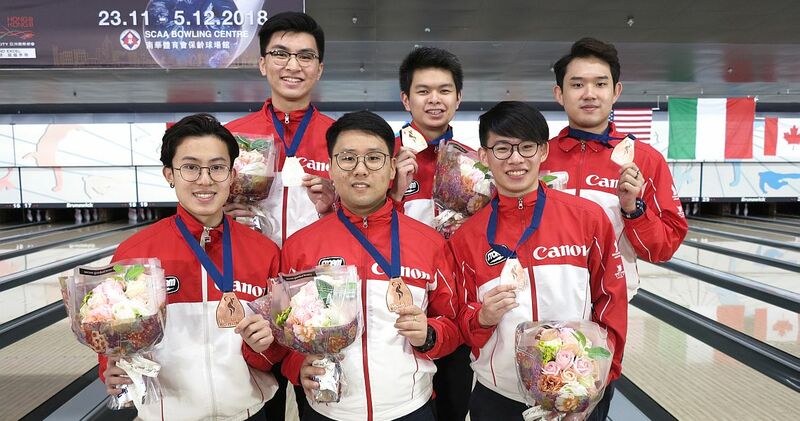 The young Singaporean team (pictured left) featuring Basil Ng, Keith Saw, Jonovan Neo, Darren Ong, Jaris Goh and no. 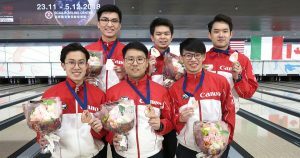 6 Joel Tan, who secured their spot in the medal round in the last frame of the preliminaries, scored only two doubles in the whole match and both came in the 10th frame. 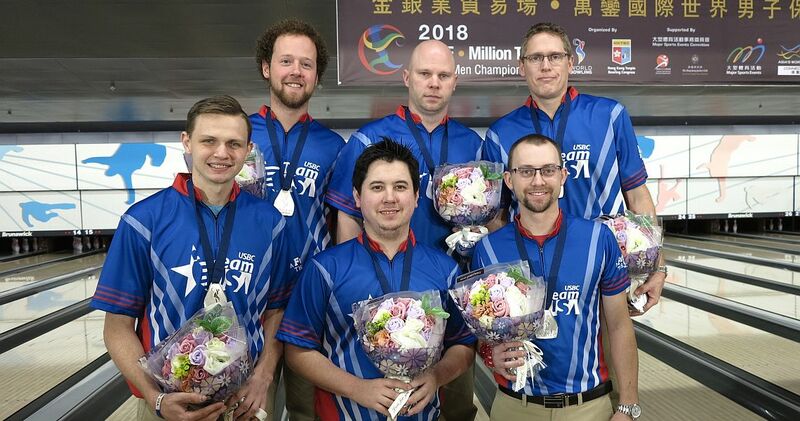 PBA champions Chris Barnes, Kyle Troup, Andrew Anderson, EJ Tackett, Tommy Jones and no. 6 Jakob Butturff (pictured right) had a four-bagger in each game and just one open frame compared to two for Singapore. 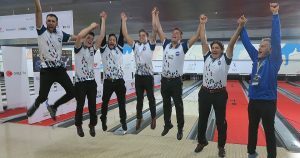 By finishing the Team preliminaries in third place, Marco Reviglio, Pierpaolo De Filippi, Erik Davolio, Nicola Pongolini and Antonino Fiorentino and no. 6 Marco Parapini had secured the first medal for Italy at a World Championship since 47 years (1971, bronze in Team event). 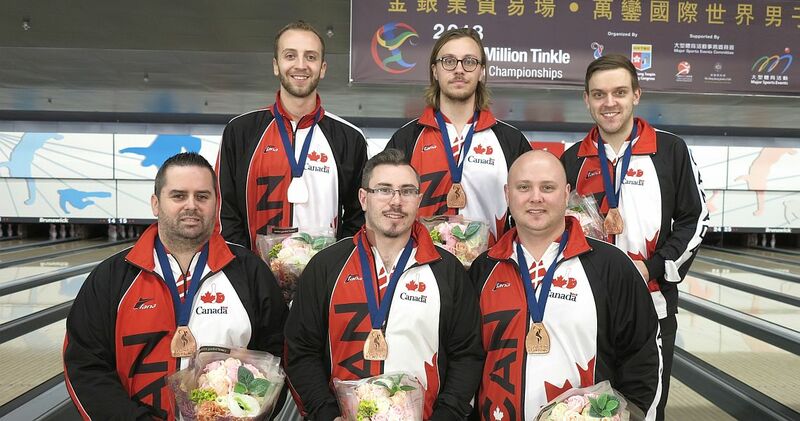 The Italians stunned Canada (pictured left) with Zach Wilkins, David Simard, Mitch Hupé, Dan MacLelland, Francois Lavoie and no. 6 Graham Fach in the other semi-final, defeating the squad of PBA champions, World Champions and USBC Open Champions, 2-1. As the higher seeded team, Canada had chosen to start on the left lane (#35), but all three games saw the team on the right lane (#36) as the winner. In the first game, Italy trailed by 23 pins in the seventh frame, but Davolio, Pongolini and Fiorentino struck in frames 8 to 10 for a 176-162 come-from-behind victory. Tides turned when the Italians were on the left lane. 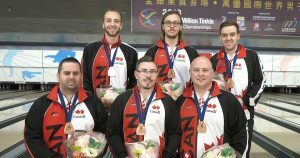 The Canadians struck on seven of their first eight shots to take a 69-pin lead in the sixth frame. 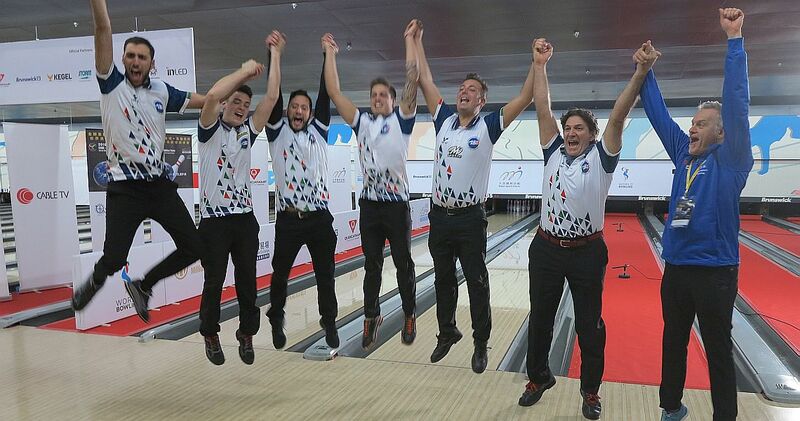 Though the Italians closed with six consecutive strikes, Canada leveled the match with 244-210 win. In the decider, the Canadians failed to double in the entire game, but stayed clean for the first three game. 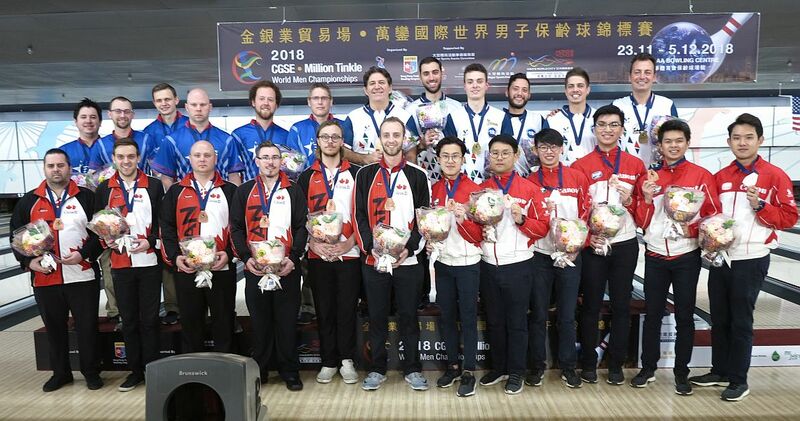 On the Italian side, Pongolini, Fiorentino and Reviglio tossed a turkey in frames 4 to 6, but a split by De Filippi in the seventh, which resulted in an open frame, gave the advantage back, as Italians led by mere 10 pins heading into the final frame. As both anchors, MacLelland and Fiorentino, suffered splits and were unable to convert them, Italy, won the game, 190-179 and the match, 2-1. In the gold medal match, USA decided to start on the left lane. Both teams doubled in the first half of the first game, Anderson and Tackett on the U.S. side and Pongolini and Fiorentino for Italy. An open frame by Barnes (2-8) gave the Italians a six-pin lead which they widened to 17 pins as Anderson opened in the eighth (6-10). While Pongolini opened in the ninth frame, Tackett tossed a strike to give anchor Jones the chance to shut out Italy with a double and a seven-count. Instead of a strike, Jones left the big four (4-6-7-10) to hand the first game to Italy. 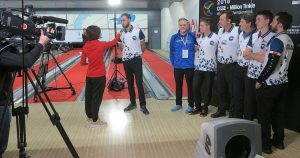 Italy started the second game with a double and five consecutive spares to pull away. Team USA was unable to double in the whole game and made two more mistakes in the sixth and 10th frame. 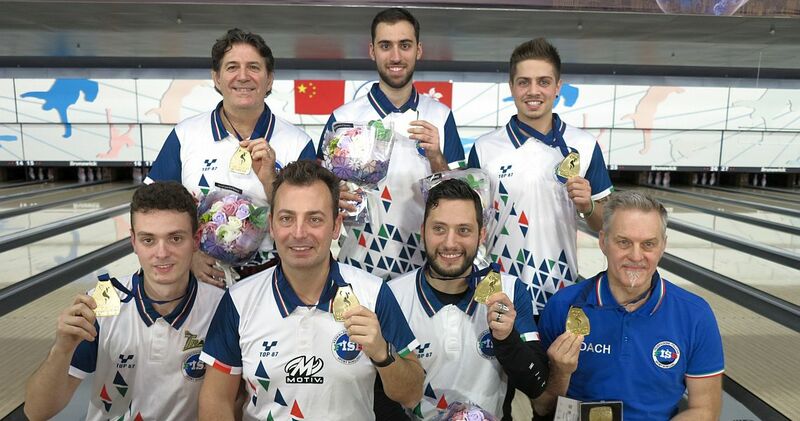 Davolio and Pongolini scored another double in the 8th and 9th frame to give Fiorentino the chance to shut out the Americans with an 8-count on his first shot in the 10th frame. Fiorentino sealed the victory with 9-spare-8 and the celebration began as the World Championships are over for the Italians. Earlier on Tuesday, Pongolini and Fiorentino got eliminated in Masters Round of 24. Action shifts to the Masters match play finals, which will conclude the World Men Championships Wednesday night.